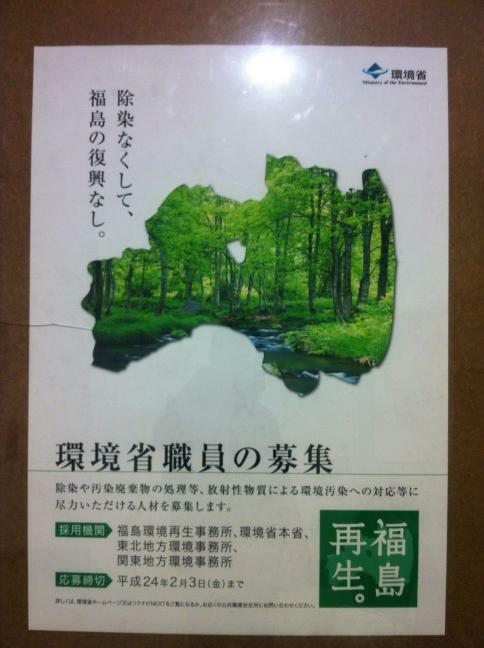 Lush green in the shape of Fukushima Prefecture. “Without Decontamination, There Will Be No Recovery of Fukushima”, in the literary style that evokes days before the World War II. The Ministry is looking to hire people for its effort to decontaminate the contaminated areas, particularly that in Fukushima Prefecture and to promote wide-area processing of contaminated debris . Application deadline is Friday, February 3, 2012.